This week our baby girl measures around the same size as a spaghetti squash (11 inches) and now weighs about 1 whole pound! She is really getting big in there. 5 weeks ago she was only 5.1 inches! It's crazy to think she will be growing much bigger over the next few weeks and months. This week our baby girl is developing her senses. She's got taste buds and nerve endings that are advanced enough that she can now experience how it feels to touch and although she is in a sack of water she can feel her mouth, fingers, tummy, legs and even her umbilical cord. It is strange to think she will be able to feel the textures of those areas. On Friday morning we had an appointment at the antenatal clinic with one of the doctors for a review of my blood results and liver scan results. I knew that a lot of them had come back as normal and that my liver function tests had gone down since the general bloods I had done after my 20 week scan. However I did have some cells which are related to the stomach and red/ white blood cell production in my blood which can be a sign of many different conditions and problems so I have now been refereed for further investigation regarding that with the main hospital. I was also given an appointment to repeat the blood tests and if they came back as normal I would not need any further tests regarding my liver. She did then tell me I wouldn't be given any anti-histamines now and that we needed to find the problem and why I was itchy. I wasn't that bothered about the anti histamines at first on Friday however I hadn't thought they gave me any relief. That lasted about 24 hours before the itching got worse and started to get noticeably worse as each day passed. By the time Wednesday night came I was ready to cry with the frustration of feeling itchy! I was now getting itchy under my nails on both my hands and feet. I also started to get cramps in my hands at night from the constant itching. I know I shouldn't scratch when it itches badly but I can't stop it. If I don't scratch it then it will burn and pretty soon my whole body will burn like crazy! This week our baby girl has become much more active and is moving so much during both the day and night. She does feel quite high up and sometimes I feel her kicking around my ribs (although my womb isn't that high yet). There are times when I think she is unhappy that I am being extra active such as walking more than normal or if I walk faster than my usual pace as she will get herself right down into my pelvis and kick what I am presuming is my cervix. The first time she did that I was really worried she would somehow come out (yep I realise just how crazy that is now! Haha). 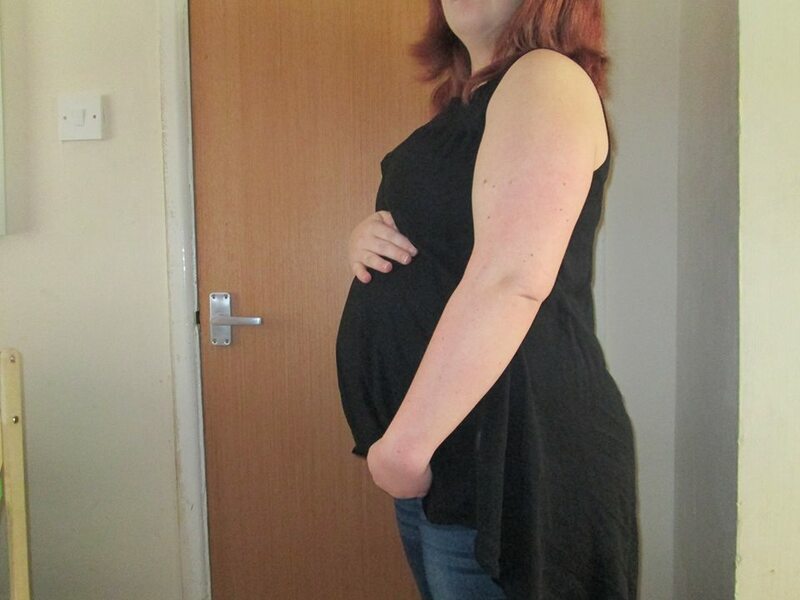 I know she is getting much stronger in her movements now as I actually seen her make my tummy move when she kicked this week which I hadn't been expecting since I am of a larger size and that would make it harder to see her movements on the outside. She is very much like D was while I was pregnant and will move happily right up to the moment when anyone else tries to feel her. Simon did attempt to feel her and she was kicking away until her put his hand on my tummy and she suddenly stopped! Hopefully it won't be long before she lets others feel her moving as both D and Simon are patiently waiting at the moment. D asks her very nicely "Can you please, please move for me baby?" which is beyond adorable! He also loves to lie down in bed in the mornings he is off nursery lying over my tummy and sings her some songs. He likes to sing you are my sunshine. This week I have noticed that I can no longer walk up stairs or steps in the same way I normally would. My bump seems to be in the way. I am starting to think this is just me and that I must walk up the stairs in a strange way! I have to turn my legs slightly to the side or I feel rather uncomfortable and it takes me longer to get up them that way. As for cravings I do want oranges at the moment again. I haven't really been craving them lately but the other day I just had to have one. I have also been loving Chilli Con Carne recently and I have to add extra chilli powder to mine after I make everyone theirs which is certainly pregnancy related as I am not usually a fan of spice!